Taste of Home is my favorite magazine, and I love having a bunch of recipes from the magazine all in one place! 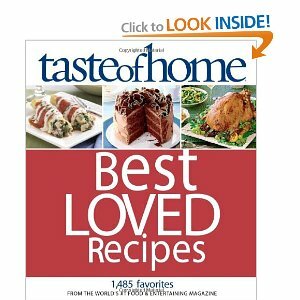 I recieved a copy of Taste of Home Best Loved Recipes: 1485 Favorites from the World's #1 Food and Entertaining Magazine at a conference last summer, and I've been loving the recipes in the cookbook! Real recipes from real home cooks—they’re what make Taste of Home one of America’s most popular—and most trusted—names in home cooking. Over the years, we’ve featured tens of thousands of recipes in our magazines and websites. But what makes this book so special is that it features not just great recipes. Not just award-winning recipes. They’re all here—cook-off winners and bake-sale favorites, must-have comfort foods and secret family recipes, regional specialties packed with flavor and style. This collection contains 1,485 of the most requested, most beloved dishes, all submitted by Taste of Home readers. The Taste of Home Best Loved Recipes cookbook can be purchased from Amazon.com. It's currently $21.81, which is 38% off the list price of $35!